Jeffrey M. Parrott began serving as Sussex County Clerk in November 2011. 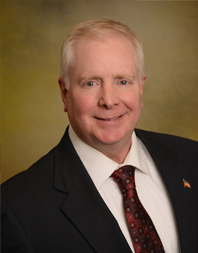 Prior to becoming Clerk, Jeff spent three years on the Sussex County Board of Chosen Freeholders and was Freeholder Director in 2010. Jeff’s career in public service includes four years on the Supreme Court Fee Arbitration Committee, seven years on the High Point Regional High School Board of Education, and six years on the Wantage Township Committee including two years as Mayor. Before his successful election bid for County Clerk, Jeff enjoyed a long and rewarding career in real estate as broker/owner of Neil Parrott Realty in Wantage Township. Since heading the Clerk’s Office, Jeff has demonstrated his ability for sound business practices by improving upon customer service and implementing many cost-saving measures, thereby saving the county’s taxpayers thousands of dollars. Jeff has been a resident of Sussex County for 45 years and is dedicated to supporting his community. He actively promotes various county veteran programs and implemented the Sussex County Veterans Identification Card which enables veterans to receive discounts on goods and services. Jeff also supports drives to fill the county’s food pantry, an enterprise operating completely through volunteerism. As a business leader and respected member of his community, Jeff brings a wealth of knowledge and experience to the Clerk’s Office. He and his staff are proud to serve the citizens of Sussex County.